Jesse and Salina are the proud parents of three-year old Faith. Salina is a stay-at-home mom and dad is a videographer and video editor for an educational foundation. Salina daily organizes a variety of learning activities for Faith. They recently emailed grandadscience pictures of a mixing activity that Faith had a lot of fun doing and learned a lot about the world she lives in, the stuff in it, and what can happen when stuff is mixed. Very young children, children not yet in school, live in the real world full of stuff they are just learning the names for. As they move around in this world—hopefully a world that looks like play)—their five senses are delivering a constant stream of data to their very open and receptive minds. As parents and grandparents out task is to populate this world with as many learning activities as possible. 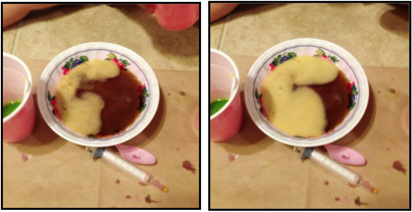 Here’s a science-play learning activity Faith and Salina did together that you might want to do with your child or grandchild. Mixing the stuff of the world together has been going on for thousands of years. In fact, alchemists—the first chemists— tried mixing everything yellow they could find in the hopes of making gold! All you need for Faith’s chemical exploration is baking soda, vinegar, food coloring, small bowls or cups, and plenty of paper towels, and a mom, dad, or grandparent. Young children are most at home on the floor and that’s a great place for this exploration. A mop will easily and quickly clean up any spilled cups or bowls. 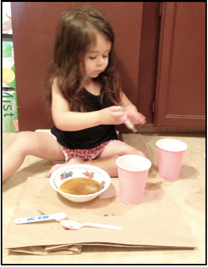 Here, Faith is cleaning up after mixing ingredients. Starting with vinegar in a bowl, Faith added food coloring to the vinegar to give the mixture the brownish-orange color. 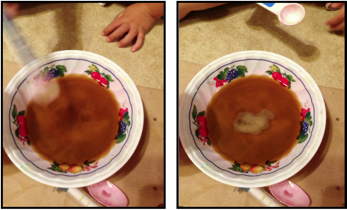 In the first picture, Faith has added baking soda to the vinegar in the bowl. 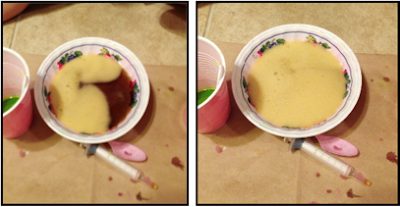 In the second picture, fizzing has started. Fizzing indicates a gas is being released and the bubbles due to the fizzing are an indication that a chemical reaction is taking place. In the next two pictures the fizzing reaction is spreading and creating a yellowish color to the mixture in the bowl. As you can see in the last two pictures the reaction is almost finished. 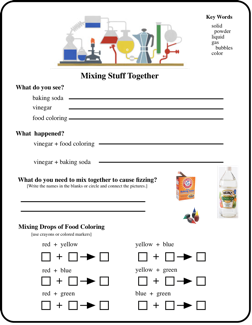 Every mixing operation has resulted in a color change but only one mixing, baking soda and vinegar, has resulted in the bubbling and fizzing that is an indication that a chemical reaction occurred. No matter the age, it’s always a good idea to have kids record, in whatever way makes sense to them, the steps used in an exploration and the results of the exploration. After all, If Edison hadn’t kept a list of the 900 plus substances he tried as the filament of his light bulb, he would have waste time by repeating experiments that were known failures. In that spirit, I’ve created a Mixing Stuff Together page for just this purpose. Adapt the form to fit your needs. Here’s a picture of the page. Thanks to Jesse and Salina for sharing Faith and her exploration with those that drop in to read this blog. 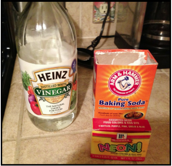 By the way, I’m sure you are anxious to know that adding baking soda to vinegar creates the compounds sodium acetate, water, and carbon dioxide. The carbon dioxide is the gas bubbling off and the sodium acetate is in solution with the water. Great post! Thank you for sharing it!